Right out of the box, the One-Touch Video Capture is ready to capture video with the touch of just one button. 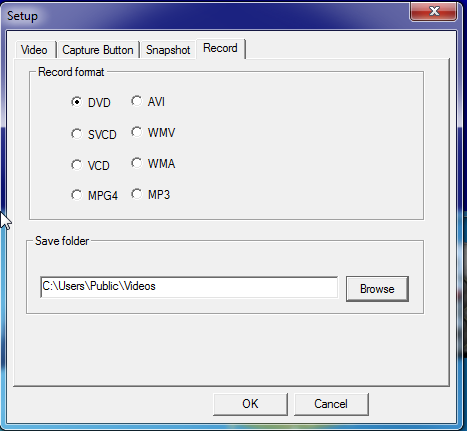 Burn full-screen video capture, edit and create DVD and VCDs. Upload your finished videos to YouTube and other popular video sites or just share them with friends and family. Why is Showbiz giving me a “device is in use by another software” error? This behavior is typically seen when either the EZgrabber, or some other application, is using the VC500 hardware. From the desktop screen, click File Explorer icon from the taskbar. Click on the “This PC” or “computer” option on the left. Double click on that, follow the path listed above. Once the file listed above is located and opened, you can copy this data into the file so it reads correctly. Why can’t I hear audio when I play back the video I just captured? Make sure the White and Red cables are connected to the audio output. If you are able to hear audio during the recording make sure you are not using a playback program like Windows Media player. It will not play back the audio. 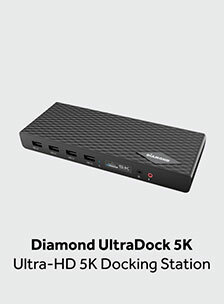 Most other video players are capable of playing back the video and audio. The program most used for video playback is a free player named VLC. It has the codecs to play back just about any video file. This behavior is seen with onboard video chipsets, it has to do with shared memory between the processor and the video chipset. You can sometimes solve this with an update to the video driver, but it doesn’t always work. The best solution is to use the capture module in Showbiz. Make sure that the source is set for “Capture device” and the “audio device” is set for “Audio Pin Source.” and it should just work. Walkthrough Available Here. 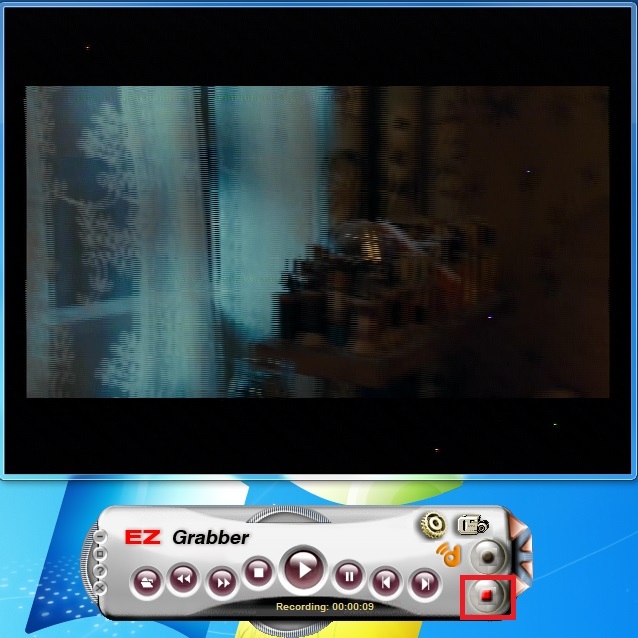 If you get an error about the device being in use by another application, make sure that the EZgrabber is closed. If you continue to get this error please consult this FAQ. Windows 7 does not require this to be installed. Windows 7 comes default with Direct X 11, and it is fully backwards compatible. This update was for Windows XP, which is no longer supported. Why am I getting a error in Showbiz saying capture failed error? 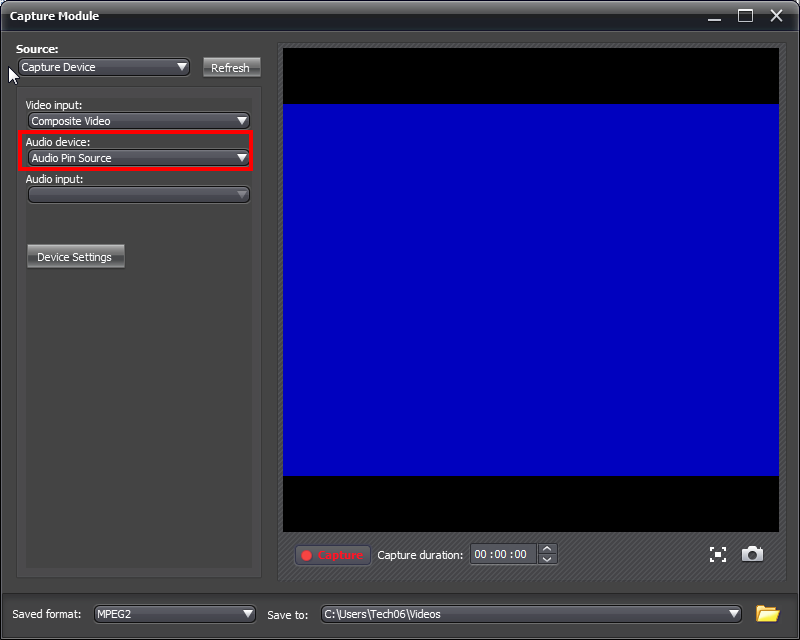 If you get a capture failed error in Showbiz it may mean the video format is set to PAL_D. If this is the case change simply change the setting from PAL_D to NTSC_M and this will resolve the issue. There is a button for “Device Settings”, click on this button and a new window will pop out. There should be a minimum of 2 tabs. The one we want is “Video Decoder”. On this tab, there is a setting for “Video Standard” – It must be set for NTSC_M for North America. You may need to Scroll up on the list to find the correct option. Start by decompressing the file that you downloaded from above. Then open the device manager. You can do this by right-clicking on the start button and selecting the option for “Device manager”. 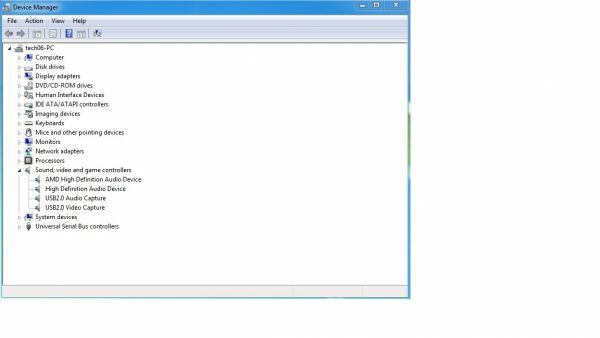 1) Go into device manager with the VC500 device plugged in and locate the “E-home Infrared Receiver” device under “Universal Serial Bus Controllers” or the “OTG102” device under the “Other” category. Once you have located it right click on it and select the “Update Driver Software…” option from the shortcut menu. 2) Once the update window opens, select the “Browse my computer for driver software” option. That will take you to a screen with a location and a “Browse” button. 4) Below the list, on the right-hand side, click on the button that says: “Have Disk…” That will open up another window with a location bar and a browse button. 5) Click on the browse button, and a file browser window will open. Navigate to the folder where your files are stored. 6) There are several folders, one of them should be labeled “Driver” head into that folder and you should see a couple more folders. 7) The next folder you select is determined by your version of windows. If you are using a 64 bit Version of windows, then you want to select the “X64” folder. If your system is 32 bit, you want to select the “X86” Folder. 8) The next folder will be an “inf” folder. Either “x64inf” if you are using a 64-bit version of windows or an “x86inf” if you are using a 32-bit version. 11) Right-click on the “OTG102” and select the “Update Driver Software…” option from the shortcut menu. 12) Once the update window opens, select the “Browse my computer for driver software” option. That will take you to a screen with a location and a “Browse” button. 13) Click on the browse button, and a file browser window will open. Click on the “computer” option on the left side and double click on your CD or DVD drive. 14) Once back onto the disk select the driver folder and press “OK” Then click “Next”. 15) The driver should install and the correct drivers for the VC500 device should be installed. 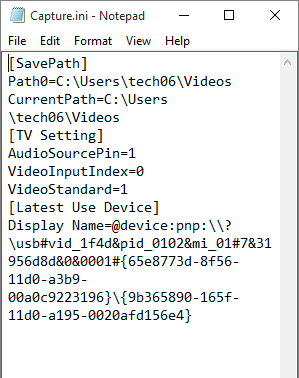 You can double check by looking under “Sound, Video, and Game Controllers” for a “USB2.0 Video Capture Device” and a “USB2.0 Audio Capture Device”. Let us know if you have any other questions or problems with the Process, we’ll be glad to help. 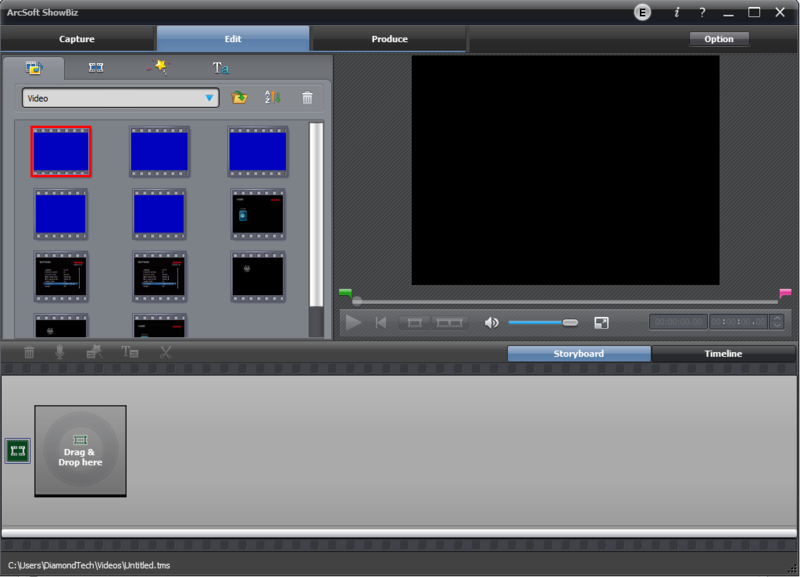 Starting at the top left, We have Video Format. This refers to the data coming off of your source device. For North America, it should be set to “NTSC_M”, if you get nothing listed here, it indicates that the device is not detected or that there is an issue with the drivers. Please see this FAQ. The next option, to the right, is the video input source, this controls how the vc500 pulls in the data. You can select “composite”, which will use the yellow video pin, or “S-Video” which uses the black video connector(cable not included). The options at the bottom control how the video looks, you can set those to modify how the video looks before it is saved. On this tab, you control what the physical button on the VC500 does. By default it is set, as pictured, for a snapshot. 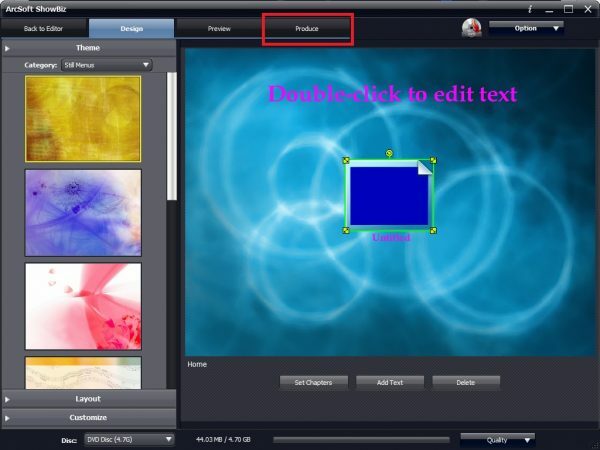 This means that pressing the button will capture one frame of the video, and save it as a picture. You can set it to “Capture Video”, and that will allow you start and stop video recordings by pressing the physical button. The save location can be set to any location on your system, we recommend the one listed in the image. The save folder is where your captured video will be stored on your computer. They will be sent to the location specified and be named with a date and time stamp. VC500MAC(Rev. B) -> How to allow NON-administrators to access the Empia software. One of the files created when the Empia software is installed is set by default to only allow administrators to read, and write to the file. In order for a user or group to access the file, they require read and write permissions as well. To locate this file simply click on the spotlight search (magnifying glass) icon in the upper right, and type in “/library/quicktime” (do not include the quotes) and press the return key. Once the folder opens, you should see 3 files, and one of should be the “empia.comp” file. Right click on it and select the option for “get Info”. One of the options in the get info menu is “Sharing & Permissions”. Click on the lock at the bottom, and enter you administrator password, to allow changes. Allow read and write access to the appropriate user and/or groups, log out completely, and login into the non-admin account. The software should then function for the non-administrator user. Opening the Empia software can sometimes cause a loud squelching noise. This sound is referred to as feedback. It is caused by the microphone picking up the sound from the speakers and sending it back out again. To solve this issue, you will need to change the default input device in the Empia software. We recommend you mute your speakers before beginning. Start by opening the Empia software. Click on the “record” tab at the top, and select the “sound settings…” option. 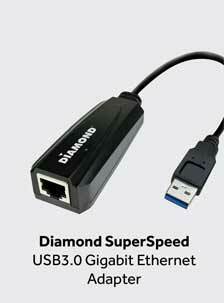 Select the “USB 28286 device” and click on the “OK” option in the lower right hand corner. Un-mute the speakers, and play content from your source device. You should be able to hear the audio from the source device. Once you can hear the source audio, you are good to start recording. If you are installing the Power Director software and get the following error. The application has failed to start because its side by side configuration is incorrect. Please see the application event log or use the command line systrace.exe tool for more detail. 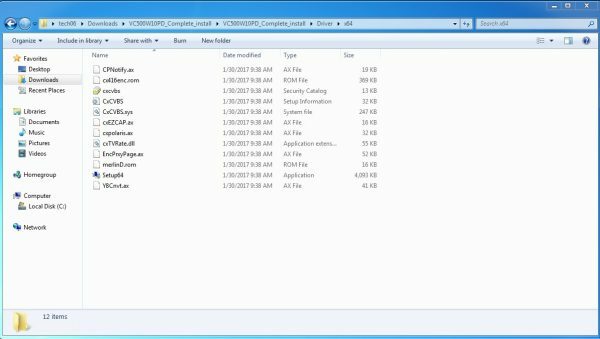 Download and run the Windows file in the link below. Power Director crashes when I opened it. There is a Windows update that is causing problems for the Power Director software that causes it to crash from the moment you open it or will let you get as far as clicking on the Full Feature Editor and will crash. Cyberlink has developed a fix for this issue and the link to the fix is below. No “capture device” shown in the showbiz capture module. This indicates that either the device driver is not installed, that windows has installed the wrong driver or that the device was not connected before the application was opened. Please try to restart the application, if you still do not see the option for “capture device” then please try this: Manual Driver Installation. If you see a device listed as an “OTG102” please try and re-install the driver from the disk. If this does not solve the issue you will need to go into your device manager and manually update your driver. Please follow the steps below. 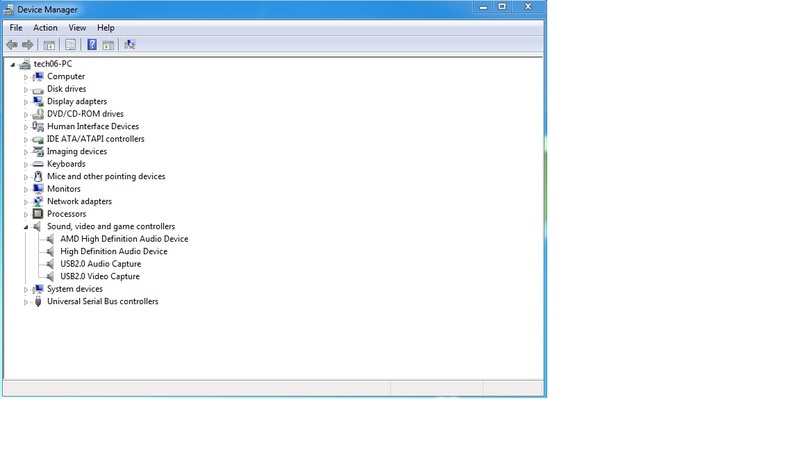 1) Go into device manager with our device plugged in and locate the “E-home Infrared Receiver” device under “Universal Serial Bus Controllers” or the “OTG102” device under the “Other” category. Once you have located it right click on it and select the “Update Driver Software…” option from the shortcut menu. 4) Below the list, on the right hand side, click on the button that says: “Have Disk…” That will open up another window with a location bar and a browse button. 5) Click on the browse button, and a file browser window will open. Click on the “computer” option on the left side and double click on your CD or DVD drive. 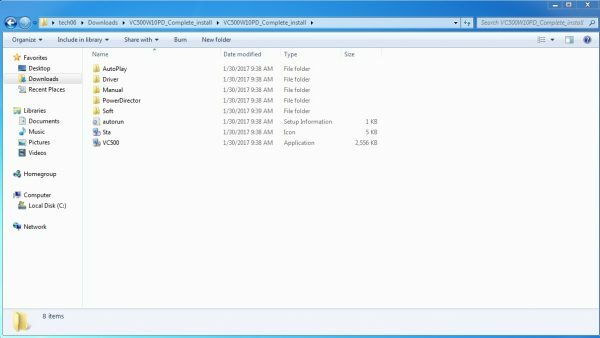 6) On the disk are several folders, one of them should be labeled “Driver” head into that folder and you should see a couple more folders. 7) The next folder you select is determined by you version of windows. If you are using a 64 bit Version of windows, then you want to select the “X64” folder. If you system is 32 bit, the you want to select the “X86” Folder. 8) The next folder will be an “inf” folder. Either “x64inf” if you are using a 64 bit version of windows or an “x86inf” if you are using a 32 bit version. 11) Right click on the “OTG102” and select the “Update Driver Software…” option from the shortcut menu. The VC500CXT model device is supported on Windows 10. You can verify the model of your device by looking at the sticker on the back of the device. Any Devices purchased from an authorized retailer, after January 2014 will be one of these models. As long as it looks like the image above, the device will work on windows 10 using these Drivers. If you are having issues installing to software, please see this article. When trying to locate a file in showbiz for editing and burning, you need to know where EZgrabber is saving the files. This location can be found in the EZGrabber setup, on the “record” tab. 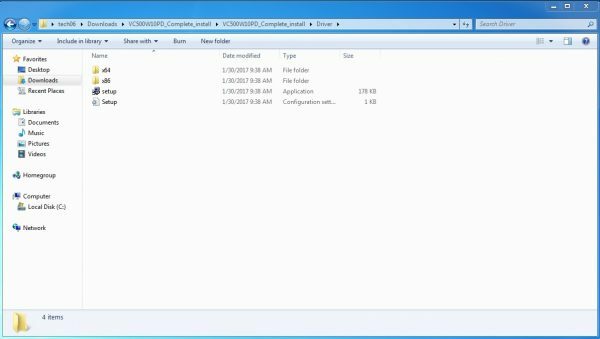 Recently, windows have begun to hide and protect the folder that EZGrabber saves to by default. This will place a copy of the file in your “Documents folder”. 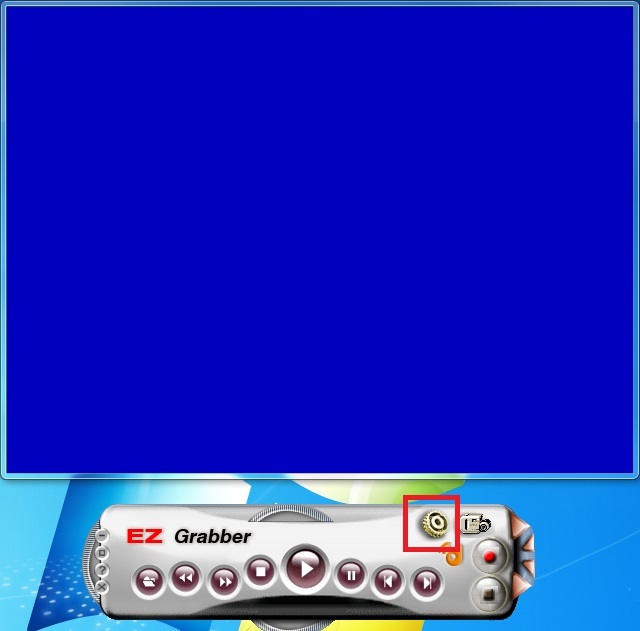 You can then correct this issue by changing the folder where EZgrabber saves the file. Follow the steps below to do this. 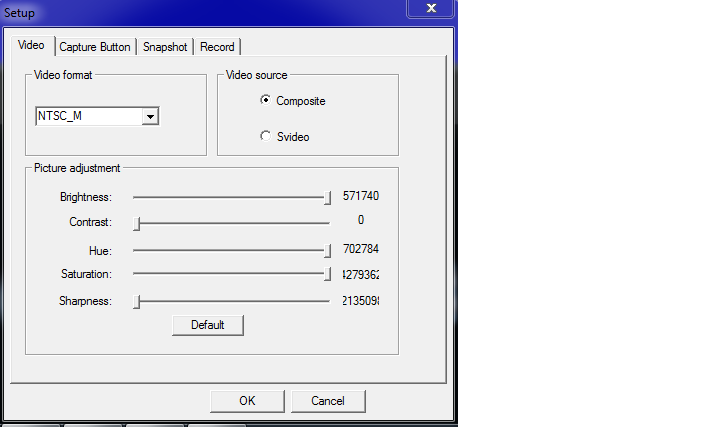 5) Verify that the “Record format” is set for DVD or MPG4, and click OK at the bottom. You should be able to record a new file, and it should output to the folder you specified. Keep in mind that if you are using the S-video for capture you still need to plug in the Red and White cables. S-video will only transmit video not audio. First; You just need to make sure that the “Capture Module” in Showbiz is configured correctly. 1) Start by Opening the showbiz software. In the upper left, click on the “Capture” tab. a) If you get an error indicating that the device is in use by another software, Please see our THIS FAQ. 3) The next object down is the “Video Input” setting. This needs to be set for composite if you are using the Yellow pin for video, or S-video if you are using a black cable for video. 4) Next is the “Audio Device” – This MUST be set for “Audio Pin Source”. If it is set for “Analog Audio in (USB2.0 Video C” in, It may produce the error mentioned in step 1. Please see the article linked above for a solution. 5) A bit further down the screen, there is a button for “Device Settings”, click on this button and a new window will pop out. There should be a minimum of 2 tabs. The one we want is “Video Decoder”. 6) On this tab, there is a setting for “Video Standard” – It must be set for NTSC_M for North America. You may need to Scroll up to the list to find the correct option. 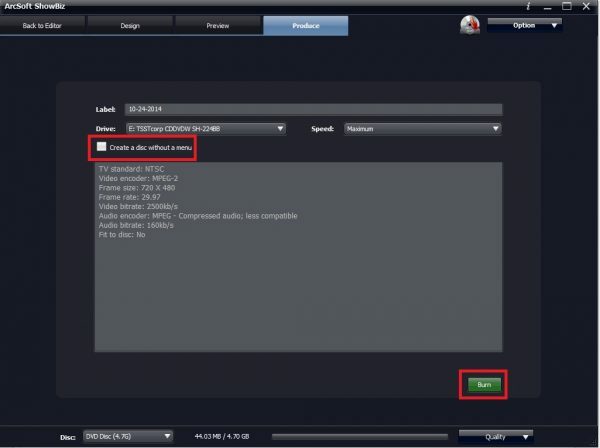 After all is set correctly, you should be able to view and record your video. Once you see the video playing, you can click on “capture”, and watch the video while it records, or set a capture duration, and go about other tasks. Once the capture duration expires, the capture will automatically stop, and the capture model will close. 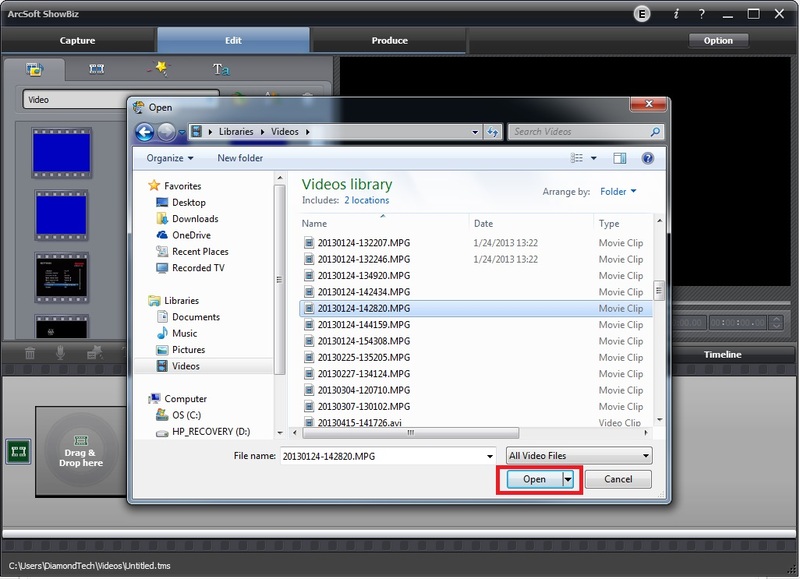 Once captured your video clips will show up in the “Library” section directly below the “Open” button of the Arcsoft ShowBiz program. 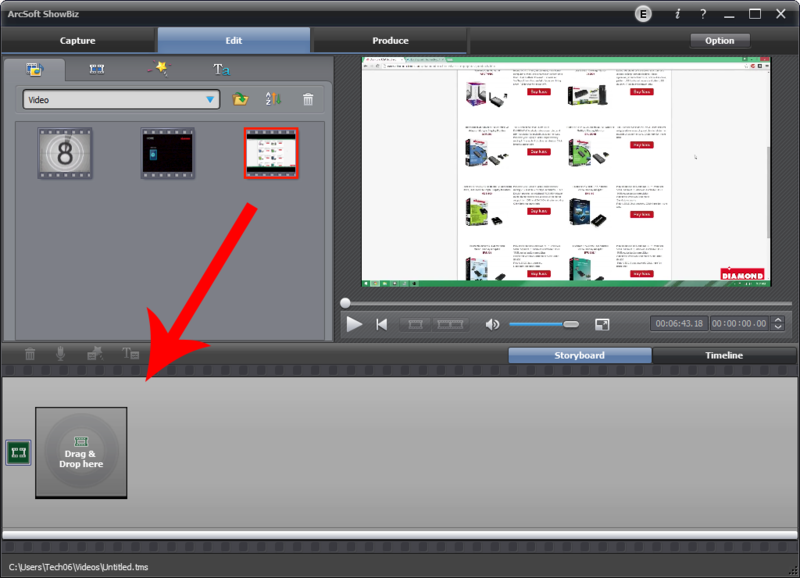 Click and hold down the mouse to drag and drop the video clips onto the “Storyboard” section located below the “Library” to add those clips to the DVD. Also, you can right-click on the active video clip that has the red square on it and selects the option “Add to Storyboard” from the context menu to add your clip to the project. 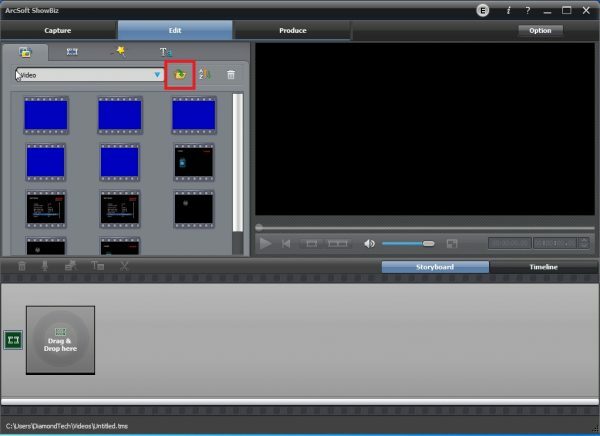 1) When your video clip is on the storyboard, click on the Scissor icon above the Storyboard (film strip) that says “Multiple Trim” to open the video editing module. 2) On the window that opens on your screen, the blue bar represents your entire video clip. The white cursor is used for tracking your video to a certain point that you want to cut your clip at. When you have played your video clip to the point you want to start cutting, pause the video clip. 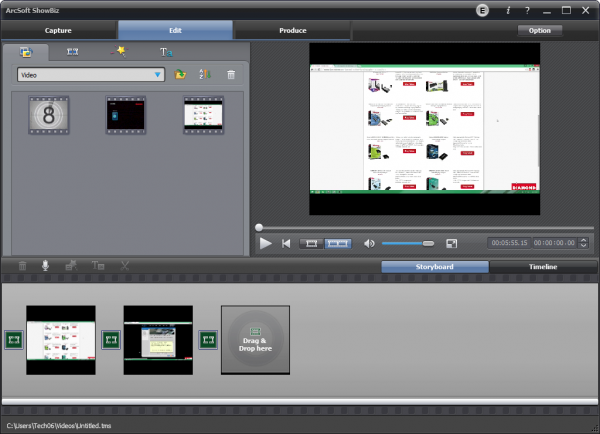 3) The green scissor icon is to “Mark In” the point where you want to start cutting your video. After clicking this button, a red arrow will appear where you made your cut, indicating that your video clip will start cutting at this point. 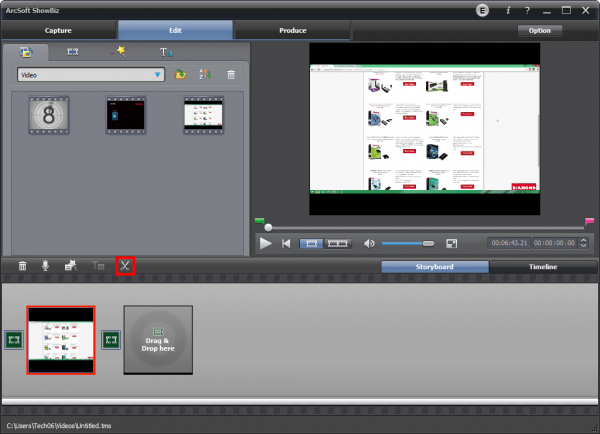 4) The red scissor icon is to “Mark Out” the point where you want to stop cutting your video. You can either continue to play your videotape until you reach the point where you want, or you can move the white cursor to a certain point in your video clip, to stop cutting your film. Once you have reached this point, click on the red scissor button and a second red arrow will appear above the blue bar. 5) At this point, the gray area is what will have been removed from the video clip. You can repeat steps 6 through 8 if there are more places to cut out from your video clip. Otherwise, click on the “OK” button to return to the Edit tab. When you look at the clip as a whole project and play it back, the portions you cut out will no longer be on the video clip. Please Note: You can do this as many times as you like. 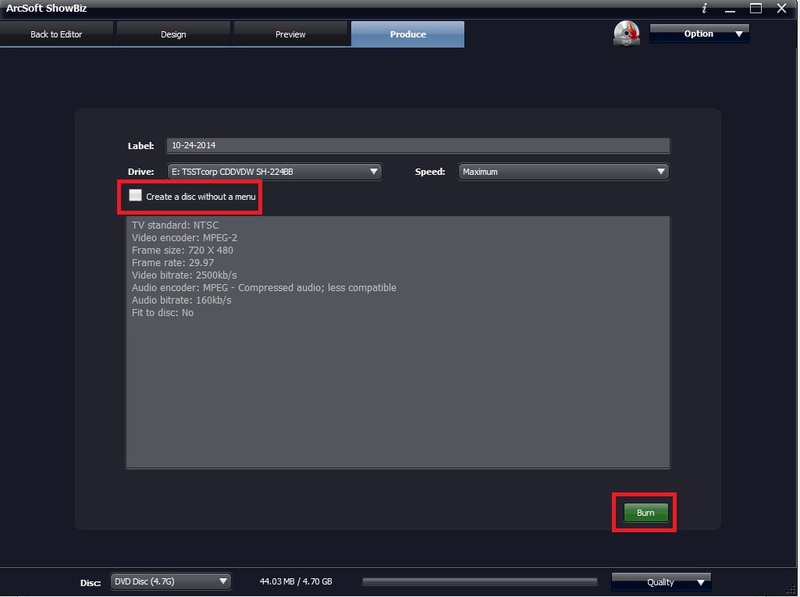 9) When you are ready to burn to DVD, click on the “Produce” tab and select the option to “Create DVD”. 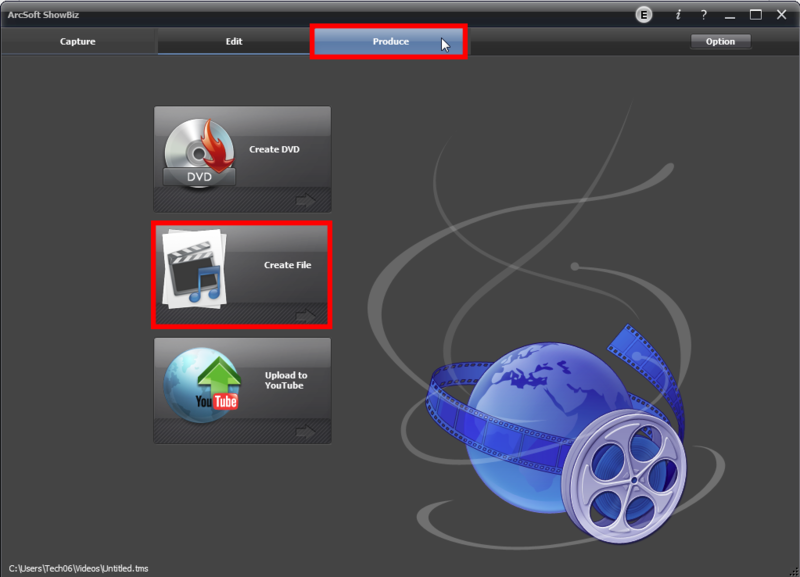 You will need to save the project when you click on the “Create DVD” option before you can continue with the DVD burning process. 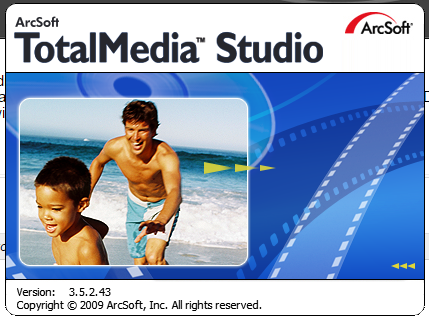 10) A program called “Arcsoft TotalMedia Studio” will open up on your computer. To simply burn the video clip to DVD, go to the “Produce” tab in this window and check off the box that says “Create a disc without a menu”. 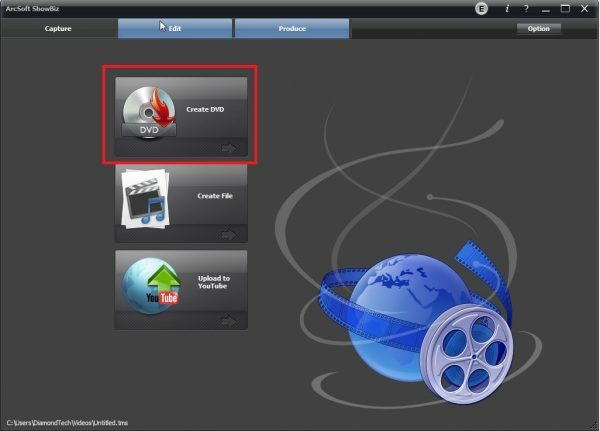 Once you have a blank DVD loaded into your DVD burner, click on the “Burn” button and the process will begin to burn the video clips to DVD format. How to install the software on Windows 10? On Windows 10. To install the driver you will need to go into the folder named Driver. Once you are in the right folder you will need to make sure the VC500 is plugged into the computer and double click on the setup64 file to install the driver. Once the install is done you can check in your device manager under sound video and game controllers. 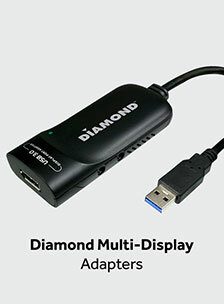 If the drivers are installed correctly you will be USB 2.0 Audio capture and USB 2.0 video capture. 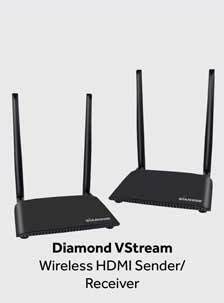 How Do I use VC500? 1) Connect the yellow composite video cable, or the S-video cable, to the back of your analog source (TV, VCR, DVD player, camcorder, or game console system) along with the red and white cables for composite audio. If you are missing one of the audio ports on your analog source, leave the missing composite audio cable disconnected. Plug the other end of the cables to the VC500CXT device. 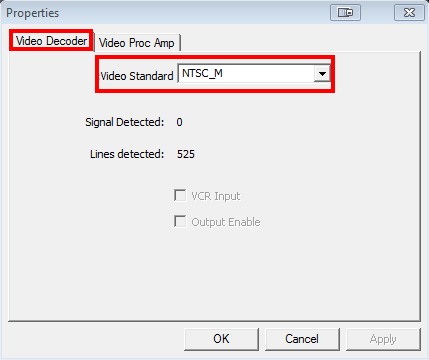 a) Under the “Video” tab, if the format is set to “PAL”, switch it to “NTSC_M” and verify that the source is set correctly to either “Composite” or “S-Video”, depending on the cables you are using with your analog source. 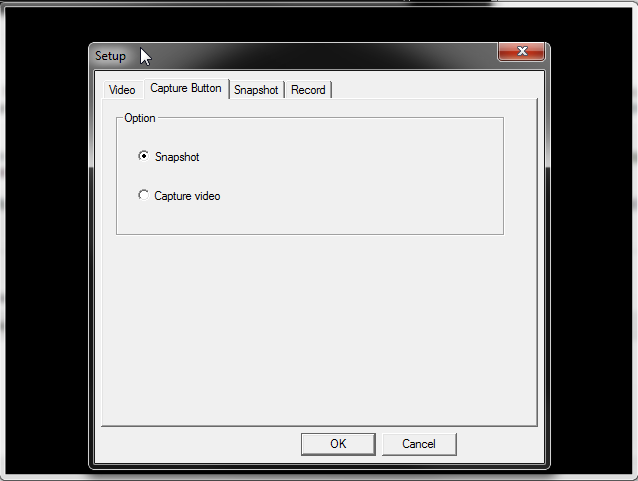 b) On the “Capture Button” tab, if you want to use the button to record video to your computer, switch it to “Capture Video”. And then select the folder that you want the files saved to. 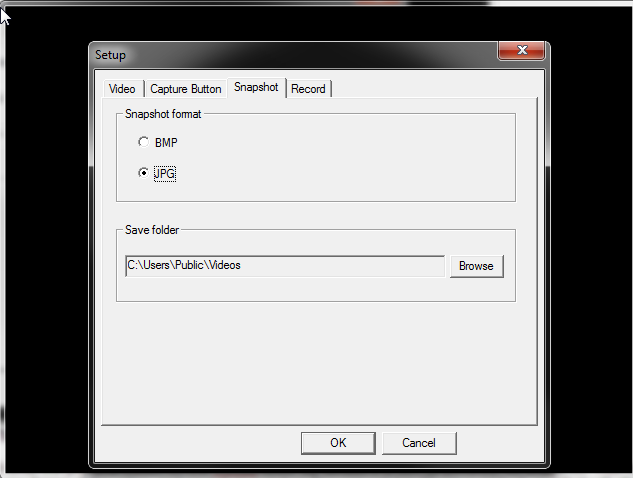 You can then select the format you want to use to capture the video. More information can be found here. 3) Start playing from your analog source and the preview screen should start showing video and audio on your monitor. If you see and hear this, you can either hit the black “REC” button on our VC500CXT device, or press the Red Circle button on the toolbar, to begin capturing the video content onto your computer from your source. If you pressed the “REC” button, then a red blinking LED will light up on the device to indicate that it is capturing. 4) Once you want to stop capturing, either press the “REC” button again or press the red square button on the toolbar, to stop capturing. Once you stop capturing, the blinking LED will go out, but you will need to physically stop or pause the analog source if you want to continue from where you left off to capture something else as this device will NOT automatically stop your analog source. 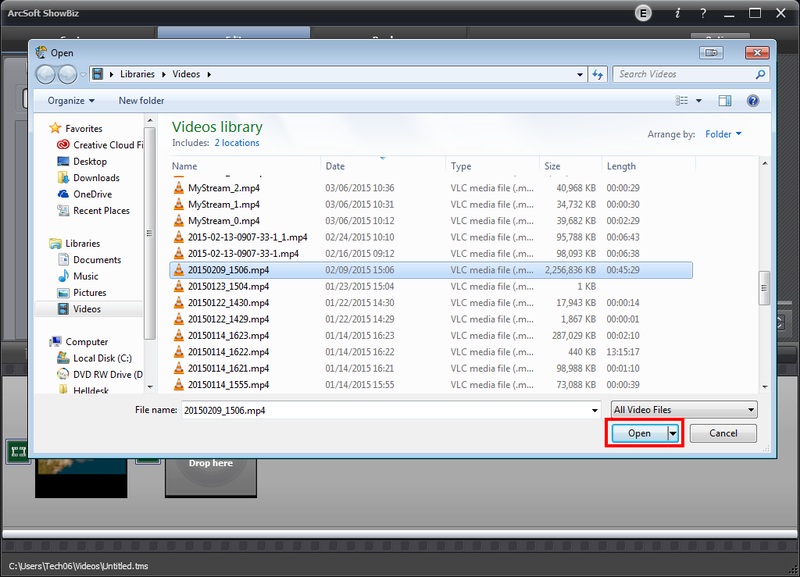 A video file will output to the location specified in the previous step. The file name specified is based on a date-time format. You can rename the file if necessary for easier recognition. 5) Once the video has been captured onto your computer, open the Arcsoft ShowBiz program located on your desktop. 6) The program opens to the “Edit” tab by default. Below the Edit tab and the “Text” button, there is a button with a green arrow on top of a folder called “Open”. Press this button to load video files into the “Library” directly below the Open button. 7) On the window that pops up on your screen, locate the directory where your captured videos are located and, after selecting each video, click the “Open” button in the lower right-hand corner of the “Open” window. 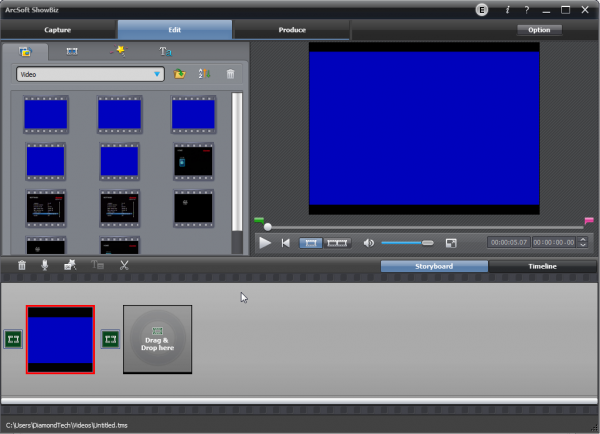 8) Your video clips will show up in the “Library” section directly below the “Open” button of the Arcsoft ShowBiz program. Click and hold down the mouse to drag and drop the video clips onto the “Storyboard” section located below the “Library” to add those clips to the DVD. Also, you can right-click on the active video clip that has the red square on it and selects the option “Add to Storyboard” from the context menu to add your clip to the project. If you need to do some editing please see this page. 1) Once the video has been captured onto your computer, open the Arcsoft ShowBiz program located on your desktop. 2) The program opens to the “Edit” tab by default. Below the Edit tab and the “Text” button, there is a button with a green arrow on top of a folder called “Open”. Press this button to load video files into the “Library” directly below the Open button. 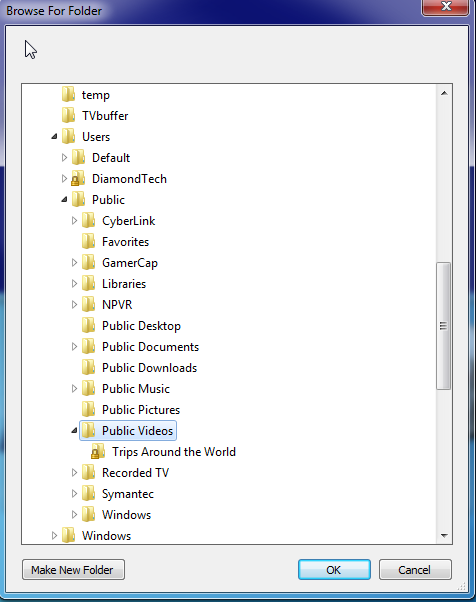 3) On the window that pops up on your screen, locate the directory where your captured videos are located and, after selecting each video, click the “Open” button in the lower right hand corner of the “Open” window. 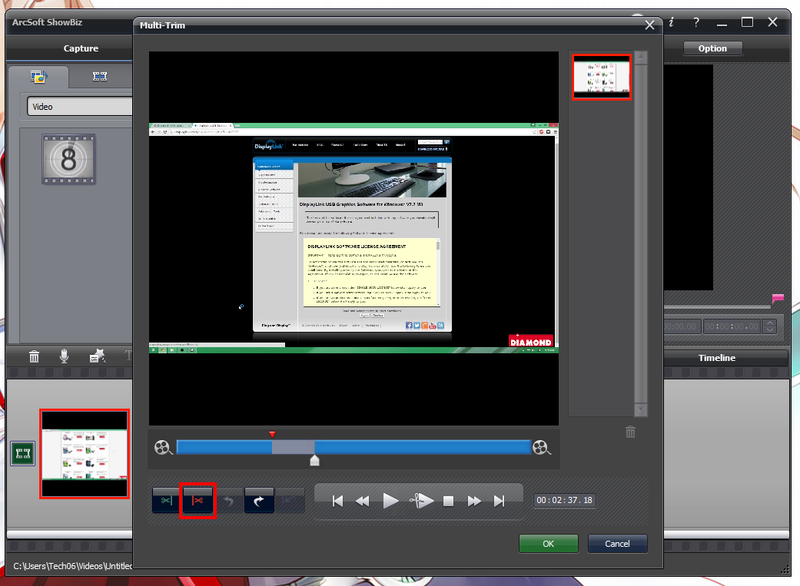 4) Your video clips will show up in the “Library” section directly below the “Open” button of the Arcsoft ShowBiz program. Click and hold down the mouse to drag and drop the video clips onto the “Storyboard” section located below the “Library” to add those clips to the DVD. Also, you can right-click on the active video clip that has the red square on it and select the option “Add to Storyboard” from the context menu to add your clip to the project. 5) When your video clip is on the storyboard, click on the Scissor icon above the Storyboard (film strip) that says “Multiple Trim” to open the video editing module. 6) On the window that opens on your screen, the blue bar represents your entire video clip. 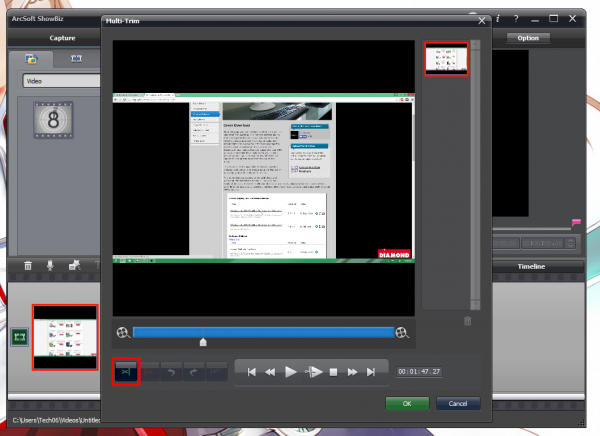 The white cursor is used for tracking your video to a certain point that you want to cut your clip at. 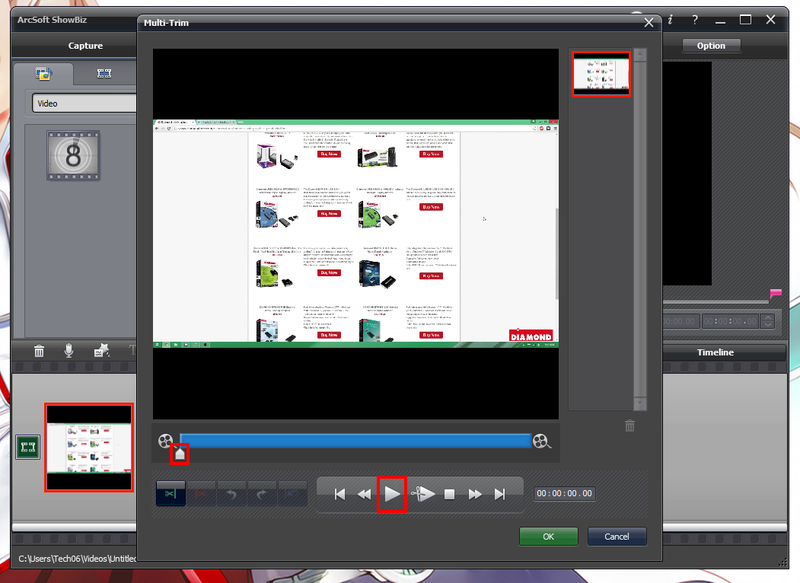 When you have played your video clip to the point you want to start cutting, pause the video clip. 7) The green scissor icon is to “Mark In” the point where you want to start cutting your video. After clicking this button, a red arrow will appear where you made your cut, indicating that your video clip will start cutting at this point. 8) The red scissor icon is to “Mark Out” the point where you want to stop cutting your video. You can either continue to play your videotape until you reach the point where you want, or you can move the white cursor to a certain point in your video clip, to stop cutting your film. Once you have reached this point, click on the red scissor button and a second red arrow will appear above the blue bar. 9) At this point, the gray area is what will have been removed from the video clip. You can repeat steps 6 through 8 if there are more places to cut out from your video clip. Otherwise, click on the “OK” button to return to the Edit tab. Yes, Indeed you can. You just need to make sure that the “Capture Module” in Showbiz is configured correctly. 4) Next is the “Audio Device” – This MUST be set for “Audio Pin Source”. If it is set for “Analog Audio in (USB2.0 Video C” in, It will produce an error. Please see the article linked above for a solution. 6) On this tab, there is a setting for “Video Standard” – It must be set for NTSC_M for north America. You may need to Scroll up in the list to find the correct option. Besides providing disk burning support, the Arcsoft Showbiz software that is included with the VC500 also has the ability to create new files and commit any edits to it. To do this you would simply edit your video as detailed here: How do I edit my video? You should then see the “Create File” window. In order to create a file, the “Type” and “Manufacturer” must be file and file format respectively (as seen above). There are several other formatting options – click on the file type for more info. 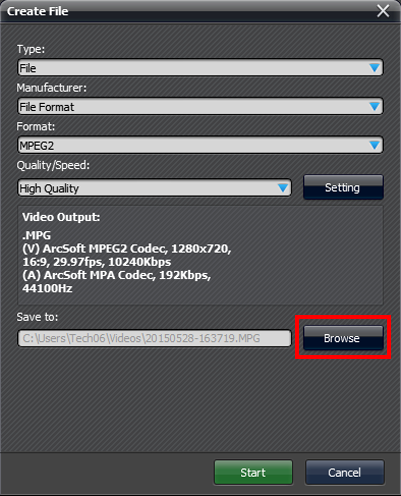 MP4 – We recommend this for Youtube uploads or archival purposes. For Quality/Speed, We recommend that you leave it on “High Quality” to preserve the data as best as possible. However, if there are file size constraints, you can set it to “Standard”. 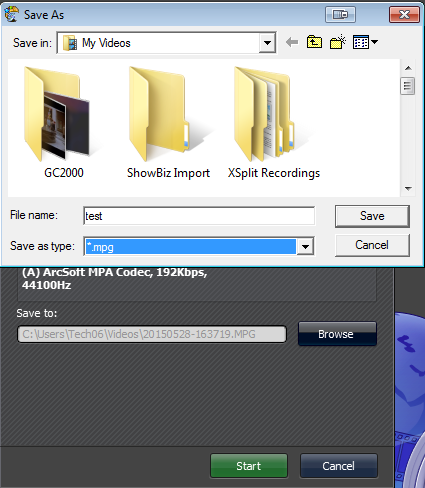 The final step before starting the file creation is set where you want the video file to be saved. By default, it will drop the file into the “My Videos” folder in your libraries. Clicking on the Browse button will allow you to choose another location on your computer to save the file. Finally, click “Start” – and the file will be created in the location you specified. The process can take a while depending on the length of the movie and the specs of your computer.